Cold and flu is an infection which can be caused by a virus and both are highly contagious infections. They both affect your respiratory system. Fact- Exercise can prevent cold and flu. Regular exercise improves your overall fitness and boosts body’s defense system or immunity against infections. When you exercise your immunity become strong which can shorten the duration of illness and can prevent you from getting sick. Fact- you can catch a cold and flu from your eyes. If you pick up the germs on your hand and then rub your eyes, the mucous membrane of an eye can catch the virus and via tear duct virus can reach out to the nasal cavity where the infection is caused. 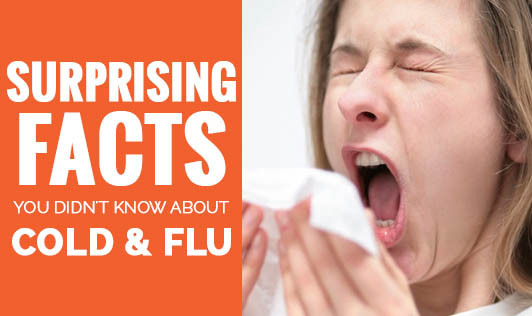 Fact- kids are more prone to cold and flu than adults. Kids are more sensitive to drop in temperature than adults and they have low resistance to infection and immature immune system which makes them prone to catch a cold and flu easily. Fact- the cold virus can travel up to 6 feet. If you are around a person that has a cold or flu, maintain at least 6 feet distance from them because the virus is quite capable to travel this much distance. Fact- antibiotic can’t cure a cold or flu. Cold or flu are caused by virus and antibiotic don’t work on viruses so the best medicine is rest and OTC medicine can ease the discomfort caused by the symptoms of cold and flu. Fact- washing hands often can help you avoid getting cold and flu. Hands are the main transmitter of the germs because hands are used to cover coughing mouths, wipe runny noses and rub itchy eyes and hence it becomes easy for germs to transmit or infect the individual. So, washing hands regularly can prevent illness and the spread of infection.